Sometimes you stumble across a book that has all the elements of biblio-intrigue: rare, relatively unknown, interesting text, and surprising author. Such was the following I picked up on Ebay recently. C[ecil]. F[rederick]. Russell. PROVENANCE. 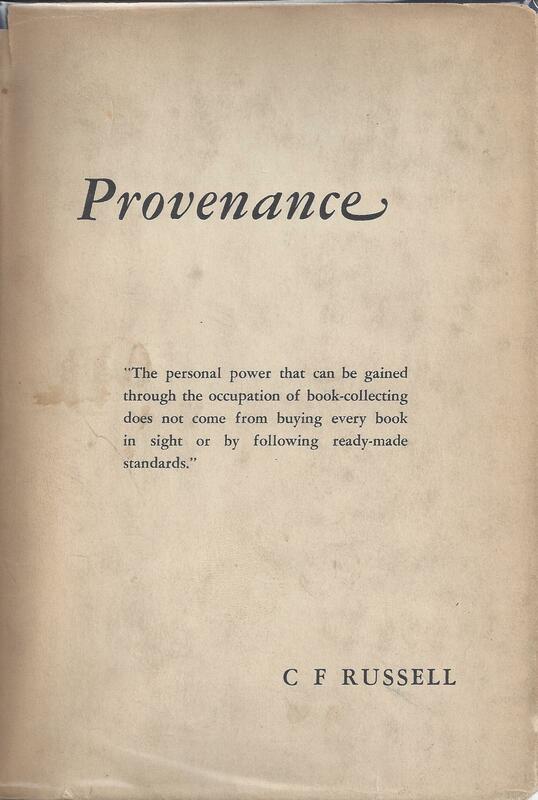 Los Angeles: The Bookhaven Press, 1944.  xi 95  p. 8vo. Blue cloth, front cover and spine stamped in yellow, dust jacket. Limitation: 50 copies. Notes: A vanity press publication by the author. “First Edition, First Issue, 50 copies” on title verso. WorldCat also records a “First Edition, Second Issue, 50 copies” with the same pagination. Cecil. F. Russell (1897-1987), one-time follower of Aleister Crowley and founder of his own splinter sect devoted to the philosophy of Thelema, published mainly pseudo-spiritual works. Information can be found here (http://cfrussell.homestead.com/files/intro.htm) and elsewhere on the net. Which LA booksellers are mentioned? Great piece about a little known book. Thanks for sharing this.